By combining the stringency of guanidinium-thiocyanate lysis with the speed and ease-of-use of silica-membrane purification, the ISOLATE II Biofluid RNA Kit provides a fast method for the purification of high-quality total RNA from biofluids including blood, serum, plasma, urine, saliva and cerebrospinal fluid. A genomic DNA column is used to remove contaminating genomic DNA. For applications that are very sensitive residual amounts of DNA remaining can be removed using DNase treatment with RNase-free DNase I that is supplied with the kit. Viral RNA can also be isolated from biofluid sources, as well as from cultured cells and tissues. ISOLATE II Biofluids RNA Kit isolates all sizes of RNA from large mRNA, viral RNA and ribosomal RNA (rRNA) down to small RNAs such as microRNA (miRNA) and short interfering RNA (siRNA). ISOLATE II Biofluids RNA Kit has been designed to deliver optimal performance in RT-qPCR in conjunction with either the SensiFAST cDNA Synthesis Kit and SensiFAST Real-Time PCR Kits, or the SensiFAST One-Step Real-Time RT-PCR Kits. Additionally, the ISOLATE II Biofluid RNA Kit can be used to purify samples prior to RT-PCR amplification using the Tetro cDNA Synthesis Kit and Bioline PCR portfolio MyTaq DNA Polymerase. 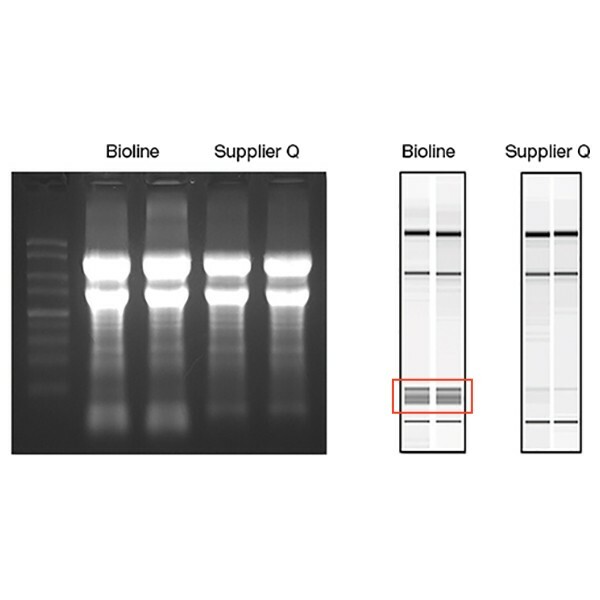 RNA was isolated from whole blood using ISOLATE II Biofluids RNA Kit and an equivalent kit from Supplier Q and analyzed by both formaldehyde agarose gel electrophoresis (left panel) and the Agilent 2100 Bioanalyzer (right panel). In contrast to Supplier Q, the ISOLATE II Biofluids RNA Kit extracted all of the RNA including the small RNA species. Fast purification of high-quality RNA from blood, serum, plasma, urine, saliva and cerebrospinal fluid. Please refer to the ISOLATE II Selection Chart to confirm the applications for which ISOLATE II Biofluid RNA Kit is the most recommended kit for your application. The DNase I Solution should be stored at -20°C upon arrival. All other components should be stored dry and at room temperature. Is it possible to increase the sample volume for the ISOLATE II Biofluids RNA kit? It is not recommended to exceed the maximum volume of 200µL to prevent clogging of the column. It is possible to split the sample and work with several columns in parallel. What do I need to consider for the clean-up of large fragments or PCR products? For the optimal recovery of large RNA/DNA fragments it is necessary to optimize the elution step. To increase the recovery rate it would be helpful to use a larger volume for elution, incubate the column with the elution buffer prior to centrifugation and use repeated elution steps. To avoid excessive dilution it may be helpful to reapply the eluted fraction again. Furthermore it could be helpful for DNA elution to heat the elution buffer to 70°C.